Budo is the collective name for Japanese Martial Arts. Some of the budo arts involve the use of weapons, others employ unarmed skills. While many arts have been adapted and developed to become modern day forms of self defence others maintain their original features and approach. The adaptation and development of some arts to become more recreational has led to continuing growth and interest in the budo arts. For example, judo, in essence a martial art and practised by many in its early form has become one of the most popular recreational activities worldwide. Since 1964 it has also enjoyed a worldwide audience as an Olympic sport. In 1955 all Japan judo champion Kenshiro Abbe came to England. Although his prowess in judo competition was supreme he viewed this success as a measure of self-development not self-adoration. Abbe was an unassuming man who embraced judo in its entirety, as an art, a recreational activity, and a sport. He insisted that judo remain a healthy, safe, confidence building activity for everyone to enjoy, whatever their ability. Abbe opposed the over-aggressive, rigid and negative approach that was becoming increasingly evident in much judo. This was not the way that Jigaro Kano, the founder of judo, had intended judo to develop. Kenshiro Abbe emphasised the use of principals of the universe; change, flow and motion, translating these to being progressive, rhythmical and harmonious. He named this approach Kyu Shin Do. During these formative years he attracted many practitioners of judo, existing and new, to enjoy judo following his approach. At that time none could have foreseen the immense and lasting influence his teaching was to have on the future of judo in the UK. Many organisations, giving pleasure to countless thousands of people, young and older, pursued his Kyn Shin Do concept. 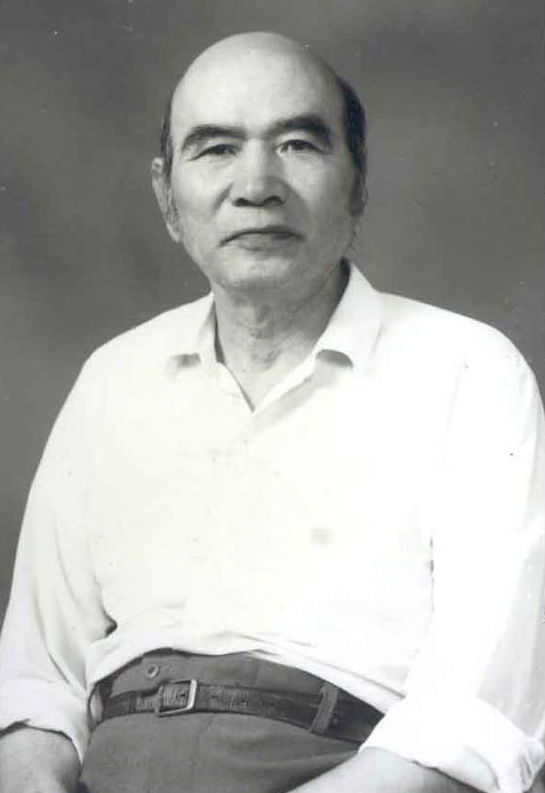 In 1982 Abbe gave approval to the formation of the Universal Budo Association. His famed quote, "Only one in a million makes champion" is central to the ethos of the UBA, encouraging harmony and enjoyment in judo and other martial arts as opposed to 'win at all cost' in the pursuit of medals. Abbe died in 1985. The UBA continues to promote his Kyu Shin Do concept of judo, and other budo arts, through its offices, affiliated centres and events. These pictures will be of particular interest to those who knew Kenshiro Abbe during the time he taught in Great Britain. There is also a video of him doing Nage No Kata. President of the Universal Budo Association John Goldman was a personal friend of Abbe and today enjoys a continuing warm friendship with members of his family in Japan. This is the first publication of these unique pictures. 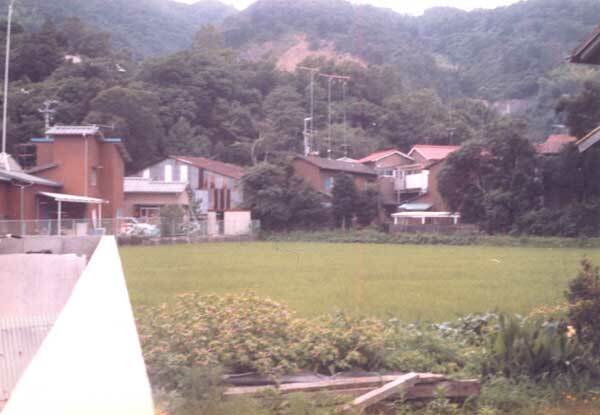 They are a selection from the many that John took during his stay with Abbe at his home in Japan in 1982. Other pictures to view show certificates awarded to, and by, Kenshiro Abbe. The UBA, under the leadership of John Goldman, 7th Dan, continues to follow, as far as possible, and promote Kenshiro Abbe's methods. The Abbe family are delighted that there is continuing interest in Kenshiro Abbe and are always pleased to hear what others are doing to promote his methods. If you have any news John will readily relay it back to the family. 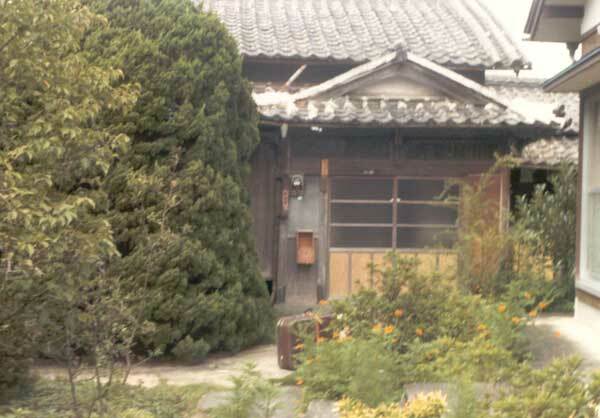 Abbe Sensei lived on the island of Shikoku, Japan, in the province of Tokushima. His home, built in traditional style, sat comfortably amidst modern constructions in a rural setting beneath 'Eyebrow' mountain. 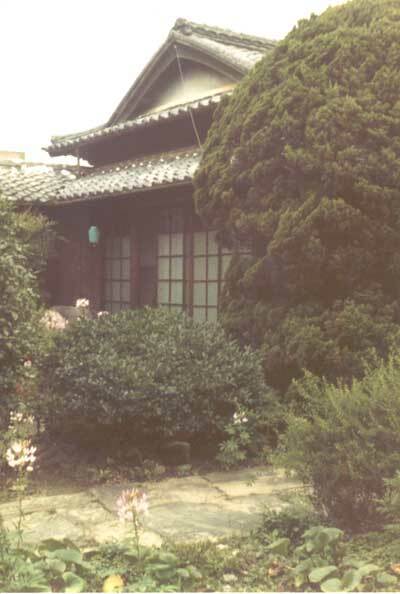 The approach to the entrance of his home (above & below) was via an abundance of greenery. 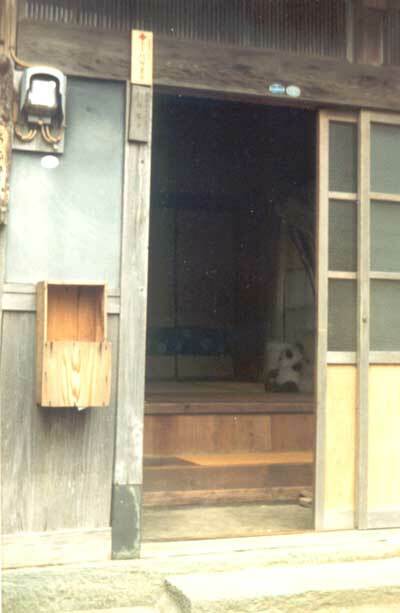 The front door was without the trappings of modern security.